Back in 2007, CBS News dubbed bird-watching the “fastest-growing sport in America,” citing that, with 75 million participants, this unlikely “spectator sport” had attracted more fans than NASCAR. 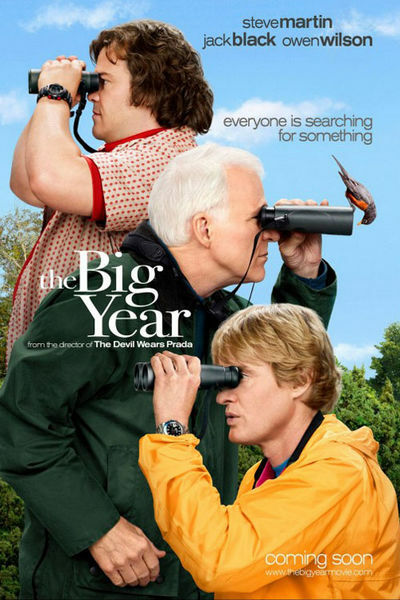 With a built-in demographic of that size, by-the-numbers birding comedy THE BIG YEAR could’ve been all woodpecker taxonomy jokes and sarcastic rejoinders about binocular etiquette, and still made a mint. Instead, director David Frankel (THE DEVIL WEARS PRADA, MARLEY & ME), in his third effort to tap nonfiction writing for its core-lurking emotional sap, has made a film intended to appeal to everyone. The result is a wholly generic, breezily innocuous 100 minutes of road-tripping, life-affirming, bird-watching fluff. Now, go back and re-read that last line without all the sarcasm in your head-voice. See – that description doesn’t have to make the movie sound terrible. (Admittedly, the tagline - “Everyone is searching for something” – kinda does). Also, they’re all searching for something, a fact of which the film repeatedly reminds us by having the characters reflect on the natural traits and behaviors of different birds… traits and behaviors that reflect the characters’ own social and domestic shortcomings or aspirations. And it’s fine that Brad is lost and lonely, and that Stu equates retirement with death and that Bostick futilely strives for something larger than conventional happiness, but that the resolutions to these issues come in such pat, pre-packaged moments – especially given the vast and varied scope of the film’s natural settings – is unfortunate. 1998’s Big Year was uncharacteristically exciting, as El Nino’s chaotic squalls flung dozens of foreign species out of their standard migration paths and into the eye-line of determined American birders. While the film hints that these meteorological tantrums also brought together three disparate men, these guys aren’t birds cast upon foreign shores, fighting alien winds… They just plain lack the raw self-awareness needed to identify the mundane latitudes over which they’re stumbling. The movie, of course, sells their tardy realization as bold revelation. If you have any questions as to the film’s structure, remember that it a) takes place over the course of a single year, and b) involves counting things. This translates to a vignette-based architecture that finds the screen alternately peppered with date markers and rolling counters that keep us up to date on the status of the competition. Gimmicky? Fortunately, not overtly – the visual devices fit the film’s playful tone almost to the point of obviousness. The only time they become intrusive is in the third act, when Frankel stops using the counter as a means to build artificial tension. That, and, like all blatant structural tools, they sometimes feel like a crutch, serving to neatly portion out the story while half-developed subplots and insubstantial side characters flit in and out of the film like nectar-tweaked hummingbirds. Additionally, Jack Black’s character is also somehow the omniscient narrator - a fact that wouldn’t be nearly as confounding if the movie didn’t feature a woefully underdeveloped birding blogger who intermittently (read: when its necessary to the plot) tracks and comments on the competitors’ birding escapades.